After the structure fire in the abandoned church at 911 – 4th avenue East on April 20, 2015, cadaver dogs detected signs that suggested there may be human remains in the rubble pile left after the fire was extinguished. To confirm that no such remains were present, a City of Olympia team composed of Olympia Fire, Police, Public Works, Parks and Community Planning & Development departments, along with Advance Environmental as the technical specialists and Quigg Brothers, Inc. managing the heavy equipment, searched the debris. No human remains were found. 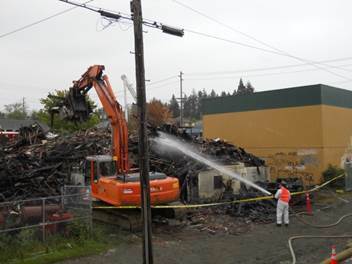 The pile still remains a potential public safety hazard so the careful removal and disposal of the debris will continue until the site has been completely cleared. 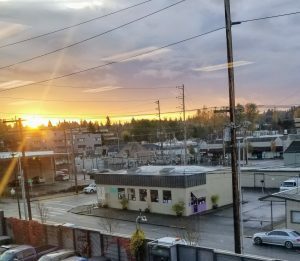 The city is bearing the costs at this point but the property owner and or future property owners will ultimately be responsible for the costs incurred. Due to the complete destruction of the building and the potential safety risks, origin and cause of the fire could not be determined, although it is likely that it was started by an unauthorized person or persons in the building as there were no utilities connected to the building at the time of the fire. Clean-up efforts will continue until all fire debris is appropriately disposed. 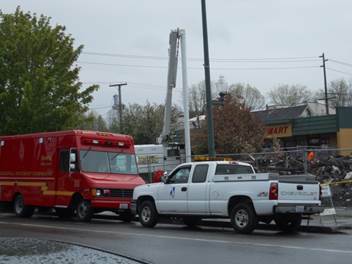 A visual distraction from any equipment involved in the clean-up will be the only impact on traffic along the 900 block of 4th Avenue. Previous stories about the fire can be found here.